Atlantis: The Second Age, a tabletop role-playing game (RPG) of sword and sorcery fantasy. Welcome to the world of Atlantis. This is a new role-playing game for a new generation that draws inspiration from the material of the original. While staying true to the original setting, this all-new game expands upon it with a dynamic magic system, exotic technomantic magical creations, and rules to bring your character's back-story and drama to life at the table. • Play as a twisted Netherman cannibal, a haughty Atlantean sorcerer, a bestial Anadaman thief, or a mercurial Jinn warrior. • Face the horrors of the dark isle of Anostos, brave the fighting-pits of Atlantis, and battle Makara on the high seas. • Uncover ancient conspiracies, cleave demented cultists, and conquer lands unseen by civilized man for a thousand years. • Rebuild the might of shattered Atlantis, or wipe clean the past and create your own empire from the dust and blood of the lost age. Will you be kingmaker, tyrant, thief, scholar, or slayer? Atlantis: The Second Age is a rich setting that uses the Omega System but can easily be adapted to most popular fantasy role-playing games. In this game, players and gamemasters will find everything they need to run a campaign in the legendary antediluvian age, including the magic of Atlantis, an atlas of Antediluvian Earth, regional guidebooks, a compendium of creatures, unique playable races, and pantheons. What is the Omega System? The game uses a straightforward rule set that utilizes a single D20 roll to resolve actions. The following section explains how to apply the rules to combat and non-combat situations. THE RESULTS TABLE All actions in the game are resolved by the following procedure: 1. Determine the Degree of Difficulty (DoD). The DoD represents the relative ease or difficulty of an action. A positive DoD represents an easy action while a negative DoD represents a difficult action. 2. Add the character’s Skill or Attribute Rating to the DoD. 3. Take the result (a positive number, a negative number, or zero) and add it to a D20 roll. 4. Consult the Results Table for the result. That’s all you really need to know. All the rules in this book are just variations of the above procedure. Players contribute by describing the Intent of their characters’ actions to the GM. 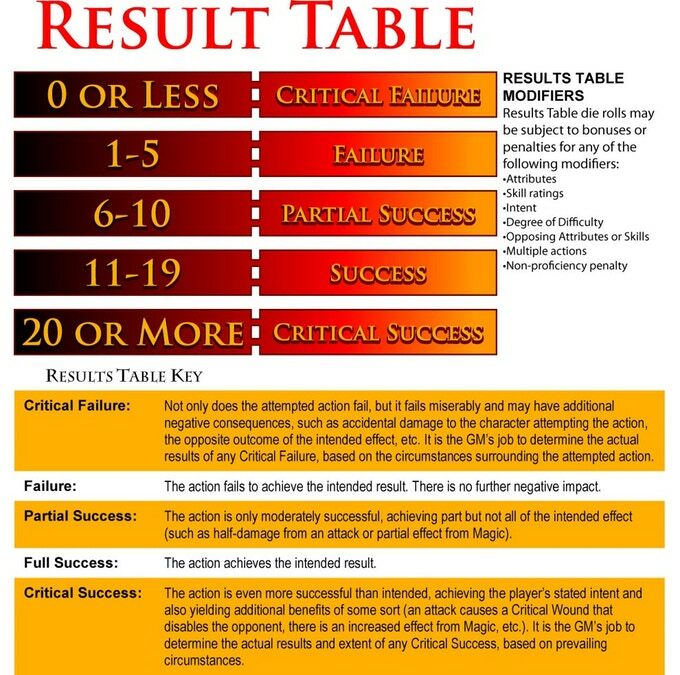 Then it is the GM’s job to interpret the outcome of the Results Table and how it affects the particular scene the player characters are involved in. Guidelines and tips for interpreting these rolls are covered later. Is there a hardcopy version available anywhere? Was wondering if there is a downloadable PDF character sheet for this game located somewhere online? Tried following the previous url and didn't find anything there. Thanks! any chance you Guys will be re-printing the Bard Games version in the future? I have the physical books. Any chance of a printable pdf character sheet? It would be nice to have the rulebook pdf updated so that the front and back covers would be part of the rulebook file. Has the update from the beta version come out yet? I got the pdf download that did not contain all the art work. The PDF has been in final form since January 2014. My one major question is if new Jin can come into being. Having read through most of the book the racial entry describes all of them as prehistoric but also mentions twins being born. They are mentioned to have become an increasingly rare sight which would imply negative population growth. Is it just that all the hero grade Jin are those that have had incarnations stretching back to before the world was made? Do you have them having children and then going on quests or some such to get new jars made for the children? Do Jina breeding create weird offshoot races born of the primordial chaos they embody? It's horrendously unclear in the book and I could use an explanation. I think its clear that new Jinni can be born. From page 40: "When a Jinni dies, his words vanish, lost until another Jinni is born." Whether this is by sexual reproduction or some other means is unclear. In terms of jars, I think there is a suggestion that new Jinni use the jars of those Jinni that have passed. However, I don't see any great issue with the idea that Jin may still make new jars, though such an artefact would likely be a pretty amazing feat of alchemy. The number of Jinni in the world is a constant - though not all of them are necessarily 'awake' and might be sealed in their brass jar somewhere. Each time a Jinni emerges from their Brass Jar, they are reborn. When a Jinni 'dies' their primordial essence (their soul if you will) is returned to their Brass Jar where they might wind up for an untold amount of time until they are "reborn". Jinn breeding with Jinn 'create' more Jinn or at least enough energy to stir a jar somewhere. Jinn breeding with other races results in whatever the other race is. There's a sidebar about breeding somewhere, as I recall. But he Publishing company has made the other 'edition' of Atlantis : The Second Age, so does that mean that there will be 2 versions of the the same? Or are we using the 'lowercase' t' to differentiate the two? This is a completely new and considerably revamped edition of Atlantis. Khepera owns the rights to the older edition and does still sell that older edition at the moment. The blurb, cover image and other details should make it clear which is which. So if I buy the beta version now, will it be updated with full artwork "alpha version" free of extra costs? No. The Alpha is not out yet, but an update should be up in a few days. I would imagine it will show up as an update to this current listing. The link you include is to an older version of the RPG, which is purchasable separately. Thanks for the info. I'd already downloaded the update to the beta (at the top of the page); now I'm looking forward to the alpha. It shouldn't be far away. The Publisher is just waiting for the last few pieces of art. I expect it will be another update to this PDF, rather than a seperate listing. I also hope there will be proofreading. I've seen a few errors that could stand to be fixed. Jerry Grayson, if you read this, check your Other Messages on your Facebook account! Doug Bramlett, Kieran Turley, and Jerry D. Grayson.